Who can resist the rich, decadent taste of caramel? It's delicious by itself, of course, but it's even better when incorporated into some type of dessert. Many of your favorite desserts can be spiced up with a little caramel, and creating delectable desserts with this tasty ingredient is way easier than you probably think. Sure, there are lots of elaborate recipes out there involving caramel, but there are plenty of simple ones, too. We found two particularly easy and tasty examples, so be sure to give them a try as soon as possible! For this recipe, you'll need a 13.2-ounce box of frozen cream puffs, 12.25 ounces of caramel — we love Peter’s caramel for almost any application — and one 16-ounce jar of hot fudge sauce. This mouth-watering dessert couldn't be easier to make. First, defrost the cream puffs according to the directions on the package. This usually only takes 45 minutes to one hour, but read the instructions ahead of time and plan accordingly. Next, heat the caramel in a small pan and bring it to a boil. Allow it to boil until it achieves a thick, chewy, glaze-like consistency, which should take about one minute. 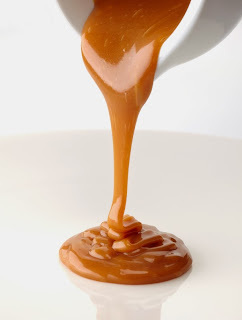 If using a candy thermometer, melt the caramel to approximately 125ºF - 150ºF. Using a pair of tongs or a fork, gently dip one side of a cream puff into the caramel sauce and then put it on the serving plate. Repeat this process for each additional puff. Plan on placing four puffs per plate. Immediately before serving your caramel-coated cream puffs, heat the hot fudge sauce on over low heat and then spoon it over the puffs. You can also set aside some extra caramel sauce and drizzle it over the completed dessert to give it a fancy appearance. As elaborate as the name of this dessert may sound, it's a snap to prepare. You'll need a carton of vanilla ice cream, a package of sliced almonds, one cup of caramel sauce and a nine-inch springform pan. Let the vanilla ice cream soften a little, and then press it into the springform pan. Freeze it in the pan until it becomes slightly firm, which should take about 10 to 15 minutes. Next, top the ice cream in the pan with the caramel sauce. You might need to heat it up a little immediately beforehand for easier pouring. Toast your sliced almonds in the oven until they are slightly browned, and then sprinkle them over the caramel sauce. Place the cake in the freezer and freeze it for anywhere from one hour to up to two days. When you're ready to serve it, just remove it from the pan, slice it up and enjoy! Once you're whetted your appetite with these delicious caramel recipes, you'll eagerly seek out more! There are plenty out there, so get baking now! What are your favorite caramel recipes? Leave us a comment and let us know!